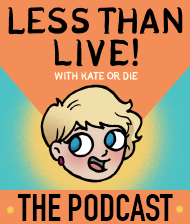 Let’s get physical | Kate or Die! No real news updates this time – I am supposed to be asleep in like FIVE MINUTES. Paleo isn’t the choice for everyone, but it’s a really great choice for me. I’ve had problems with trying to feel better about my body and lose weight before – I’m prone to obsessing and it becomes more of a disorder than a healthy choice. I like just picking good food and not eating crap. No judgment on people who do, this is just what I need to do for myself right now. I feel way more energetic, my skin looks great, I feel stronger! Will I be able to keep it up forever? TUNE IN TO FIND OUT! FOREVER!